The genus Eucalyptus belongs to the predominantly southern hemisphere family Myrtaceae. The family comprises approximately 155 genera and over 3000 species. Approximately 75 of the genera occur in Australia, predominantly in the wetter regions (Chippendale 1988). Traditionally the eucalypts have included one large genus Eucalyptus and a smaller genus Angophora (Pryor and Johnson 1981; Chippendale 1988). However, there is considerable debate concerning the taxonomic treatment of Eucalyptus and Angophora (see Ladiges and Humphries 1983; Sale et al. 1993). Johnson and Briggs (1983) have partitioned the subfamily Leptospermoideae into seven alliances, including the Eucalyptus alliance (Fig. 1.1) which is believed to be monophyletic with the Eucalyptopsis alliance. The latter alliance includes the distinctive genus Arillastrum (Johnson and Briggs 1983) which occurs in New Caledonia. The genus Eucalyptus contains over 500 species, most of which are endemic to Australia. Six Australian eucalypt species extend to New Guinea with a seventh endemic there. Three species extend beyond the Australian and New Guinean mainland (E. alba, E. urophylla and E. deglupta) to parts of Malesia and the Phillipines. Its distribution appears to follow the full extent of the Australian tectonic plate during the late Teriary (Barlow 1981; Fig. 1.1) but does not cross Huxley's Line (Eldridge et al. 1993). Barlow (1981) considers that the genus is of ancient Australian origin, although it does not appear in the fossil record in Australia until the Miocene (Holmes et al. 1982; Hill 1994). However, there are reports of fossils with affinities to Eucalyptus from Miocene deposits in both South America (Frenguelli 1953) and New Zealand (Pole 1989) and their is the possibility that major lineages had differentiated by the mid-Miocene (Holmes et al. 1982). If correct, these fossils indicate a wider past distribution and possibly a more ancient, Gondwanic origin of the genus. Nevertheless, the dramatic increase in Eucalyptus pollen in Pleistocene and more recent deposits (Singh et al. 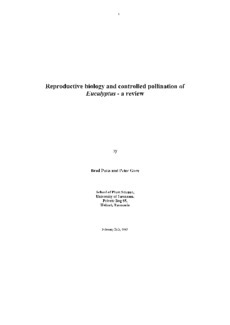 1981) suggests that the genus has recently undertaken a rapid spatial, and possibly major evolutionary radiation in the last 200,000 years as a response to increasing aridity, more seasonal climates and an increase in the occurrence of fire in Australia. They currently dominate nearly all vegetation types in Australia except rainforest and allied mesic types and only in the arid interior of Australia are eucalypts generally lacking in dominance.